Time to head up north with a few nickels so I can shop for marine hardware at the gathering. The bonus is meeting so many knowledgeable people, seeing some amazing boats and motors both on display and running in the water. I have found some hard to find parts. You never know what might follow you home. I may go Wednesday or Thursday. Not sure yet. Anyone else going? I usually see a few members there and hope to meet a few more. I was planning to go, hope to find a 60's mercury gas tank. I am thinking you have a good chance of finding a 60s Merc tank. Hope we get good weather. That boat is worth seeing from every angle. Yes, there is a twin motor hiding on the other side. Another amazing part of this is the WOODEN boat trailer... how cool is that?! I would go just to see that boat... so many other boats and motors that you donât have to spend a dime to enjoy the day checking everything out. I'll be up there from Wednesday evening through Sunday morning. Bringing "Little Blue", my MFG Niagara with the Merc 350. Looking forward going and meeting as many people as I can. I will keep an eye out for little blue. Have a safe drive. This sounds like a ball. Someone please take and post photos. I saw little blue... awesome boat . I missed meeting the owner. I also just missed meeting up with 2Stroke. Met his friend. What a nice aluminum boat! Sorry I missed Dr.Go! I saw the white race boat and the Tomahawk boat - very nice. If anyone is still here, I'll be walking around today, Saturday. I'm 6' 4" with glasses, and will be wearing the AOMCI Tomahawk 2018 baseball cap and green AOMCI Tomahawk 2018 T-shirt with khaki shorts and sandals. My cell phone is in my pocket and the number is published in the AOMCI and ACBS directories. I'll also be at the dinner in the arena tonight, Saturday. Would love to meet and talk to anyone here. My name is Dave Nau. 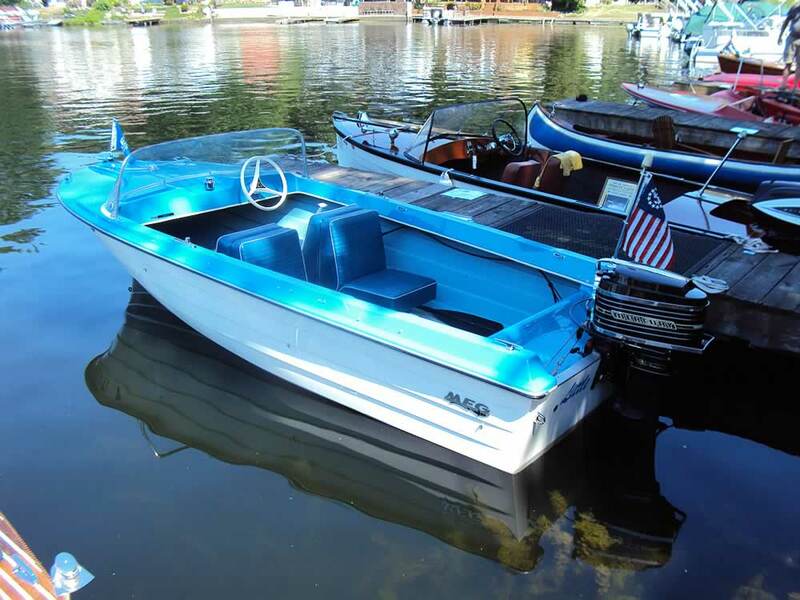 I'll also be at the Boat the Blue annual ACBS meeting and boat show in Port Huron next month, again with Little Blue. If anyone is there, please come to the Marque Club meeting at 4:30-6:00 PM on Thursday, Sept. 13 in the Blue Water Convention Center. It's not on the schedule, but we plan to have a meeting to discuss ways for the various marque clubs, ACBS and AOMCI to partner more together, with the goal to grow the hobby. There will be snacks and beverages, paid for by ACBS. If you plan to be there, let me know, so we have enough food and drink. Also, call or text me if you are up there. I was thinking that Saturday would be the big day at this meet, given people work during the week. Turns out that this is the breakdown day, and by noon, Sara Park was pretty cleared out. There is a dinner tonight in the building behind the arena. I plan to go, so we'll see who shows. I did get quite a few pictures. The Glastron tri-hull with the Johnson 70 was free to whoever wanted to drag her home. The one sign shown is at the entrance to a local bar and grill called "Outboards", as it has an outboard motor theme. Dave, Welcome to the north woods of Wi. As I found out when I moved here, Sat. is for hunting, Sun. is for packers & brewers games. Thank you for posting pics. Do to unforeseen family stuff I wasn't able to make this event. Little blue looks great as usual. The picture of the very old antique outboard running in the blue tank is Bob Grubb's 1914 Wisconsin. It won the category of oldest running outboard at the meet. Bob is shown there to the left of the motor tweaking the throttle to make sure it ran the required two minutes. It did. Pretty cool having a running Outboard over 100 years old. Great pictures. If I am not mistaken, I think when I first started going, it was Thursday through Sunday and therefore Saturday was a big day when people were off from work. I am thinking it got changed to Wednesday through Saturday to help those exhibitors that traveled so far from across the country a little more time to get back home. When you add in some rain at the wrong time like a Friday night that forces early packing, I could see why some might choose to pull out earlier Saturday. Because I often go to buy parts, it is best to go early since people are buying all day each day, so unless an item is common, it might already be gone. Now I take a day off on Wednesday or Thursday and then work Saturday to make up. I find more parts that way. I am also starting to learn to ask more questions... just because an item is not found for sale doesnÃ¢ÂÂt mean someone might not have it. They cannot always bring all they have. When I bought an item and had given up on finding the gem,... I mentioned it to that merchant and he said he had the item at home... wow - live, learn, and doÃ¢ÂÂt be afraid to ask everyone if they have seen something... you never know. I will be back next year and hopefully can stay longer than 5 hours. Couldn't make it this year, looked like a great show. Thank you for the photos. I've found some gems digging in a box or under a table at boat and car swap meets. Those of you that made it inside Outboards, the bar and grill, hope you saw the fun stainless urinal made out of a beer keg in the men's room. Some one put a sign above it "for used beer." Never been to Buffalo with a boat, so must have been another one. Been to Clayton in 2015, Chautauqua in 2016, LBOA Show in Huron, OH in 2014, and the Port Huron Show in 2017. 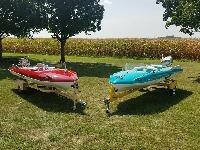 Going to the big Ã¢ÂÂBoat the BlueÃ¢ÂÂ ACBS Show in Port Huron next month. All with Ã¢ÂÂLittle BlueÃ¢ÂÂ. 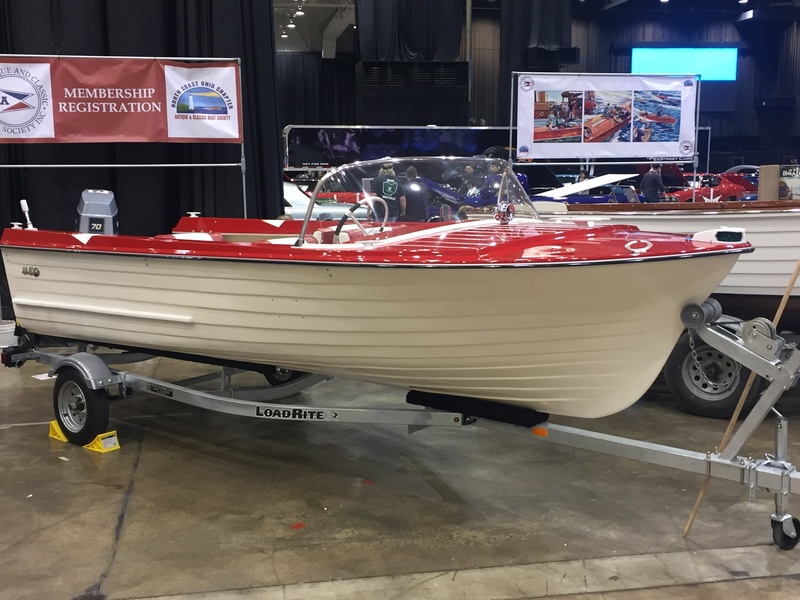 Ã¢ÂÂ Big RedÃ¢ÂÂ, my 1962 MFG Edinboro, is my user boat, while Ã¢ÂÂLittle BlueÃ¢ÂÂ I take to shows. Thanks for the great pics Dave!